Escape to Clarksville, Virginia’s only lakeside town, for a truly romantic two-night stay at Cooper’s Landing Inn & Traveler’s Tavern. On the first night when you are with us you will be treated to a delicious 4-course dinner in Traveler’s Tavern. Wake up the next morning to a scrumptious two-course breakfast in bed before heading out for a day on Kerr Lake. You will visit our sister property, Turtle Cove, where you will have three hours on the lake to kayak, paddle board, swim, or just relax. We will have your paddle board or kayak along with paddles and lifejackets waiting for you on the beach. After your water adventure, come back to shore where there will be a small table and Adirondack chairs set-up on the beach/or cliff complete with a delicious après-lake bottle of wine and a gourmet charcuterie board for two. After you spend the day at Turtle Cove, head back to Coopers and soak in our hot tub or sit by the fire and enjoy S’mores. 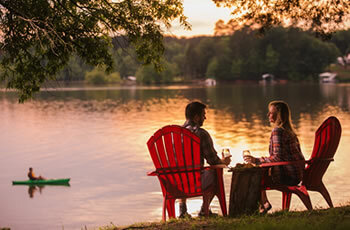 A day at Turtle Cove and a stay at Cooper’s Landing make this a truly romantic and adventurous getaway in Lake Country. $600 deluxe room, $650 double jacuzzi room, $850 private two-room jacuzzi cottage.